Boca Raton is trying to figure out what to do with what’s considered the last area of blight in downtown Boca Raton. The modern redevelopment was approved by the Planning and Zoning Board despite a strong pushback from the community worried about density. 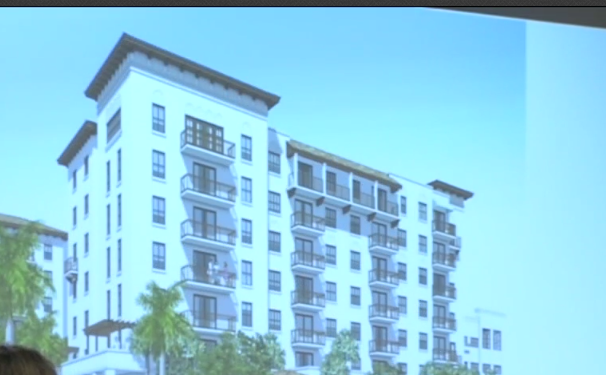 Boca Raton is trying to figure out what to do with what’s considered the last area of blight in downtown Boca Raton. The modern redevelopment was approved by the Planning and Zoning Board, despite a strong pushback from the community worried about density. The project is located at 171 West Camino Real. The plan would take the defunct shopping center and turn it into a mixed-use, shopping and residential area. It would include 350 apartments and two eight-story buildings. The land’s owner says this is the only way to make the land viable as retail slides. Most of the public who attended Thursday night’s meeting say this will add too much traffic to an area that’s already too busy. “Clearly it’s the density of the project. When you add 350 residential units, the area can’t support it. The infrastructure isn’t there. We already have crowding on the roads, we already have crowding in our schools,” Tony Gautney, a Boca resident said in an interview. There was some support for the project from the public. “Being in the area, and raising a family, a few small kids, I feel like this project is exactly what the city of Boca needs, and our neighborhood needs. I think it could be the catalyst to revitalize our area which I feel like has been neglected for some time,” said Boca Raton resident Patrick Grogan. The board will recommend the plan with one change: an additional left-hand turn lane instead of a right-hand turn lane into the project. That will hopefully mitigate some of the traffic concern. This still needs approval from the Community Redevelopment Agency, who will likely take a look at this in January.